The master oscillator operates using comprehensive cavity Q-control which provides mode locking at feedback prelase stabilization, Q-switching and selection of the single optical ultrashort pulse from the master oscillator cavity. Pulse formation at feedback stabilized prelasing provides highly reproducible generation of 70 ps pulses. 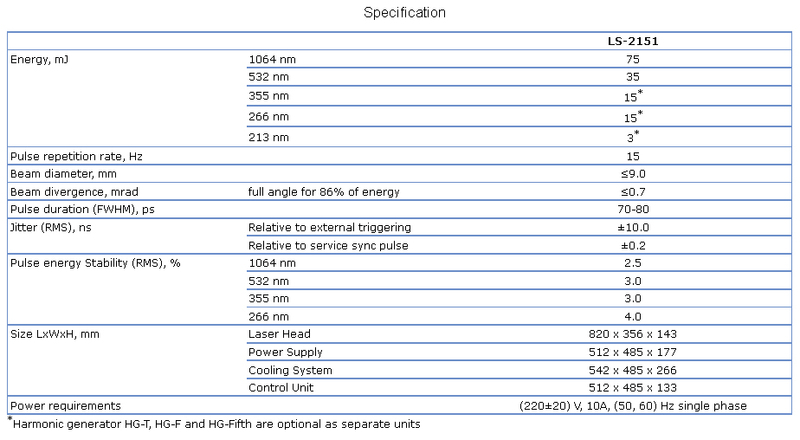 - Two LS-2151 lasers synchronization to an accuracy about of ±15 ps. The LS-2151 has built in photo-detectors monitoring the energies of the MO, PA and SH output pulses. Energy values are indicated in the laser control window of the remote control PC. Independent discharge circuits for MO and PA flash lamps allow ajustment of the output energy of laser system to optimize for the application requirements.